Stories really can be told by trees. that are seen in trees we can learn so much about the tree and what has happened to it during its life. We can see what the growing conditions are like throughout its life, we need only to improve our observation skills. Can you see each seasons growth on a tree branch?. 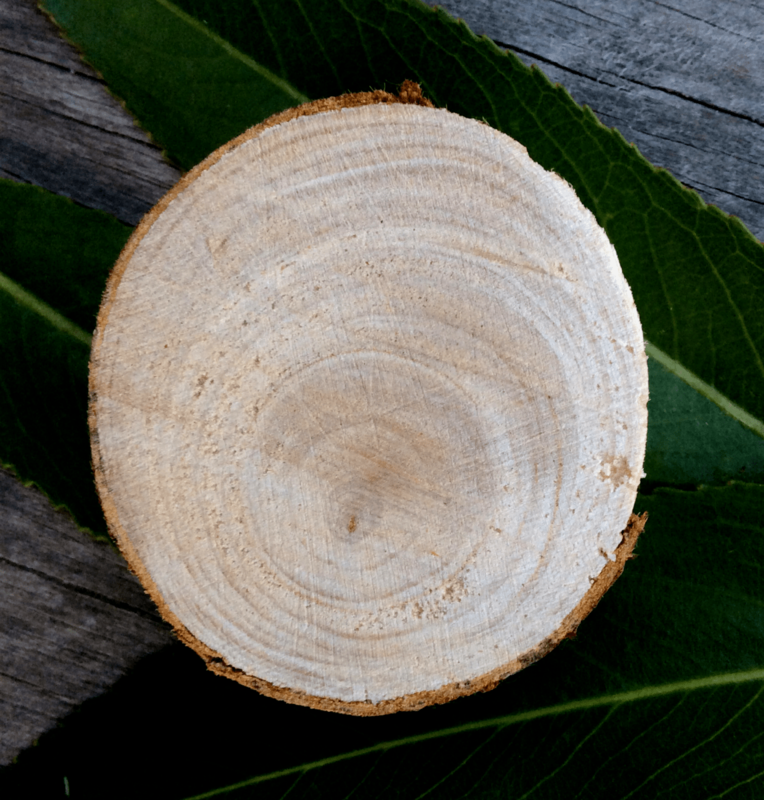 We all know about the rings inside the trunk that can be counted when its cut down. If you get a chance to ever see a large stump like this and see the rings clearly, why not count back on the rings and work out how wide the tree was when you were born or, if its a really big tree, when your Grandad was born. The Smart Happy Project with Sophie Rees has looked before at autumn’s Sticky buds of Horse Chestnut trees to see the tiny leaves and flowers all developed but wrapped up inside the bud waiting for spring. What a story it will tell as it opens! But to answer the question ‘Can you see this seasons growth on a tree branch?’ we don’t have to cut through a tree trunk, we need only look at the branches and inparticular at the ends. 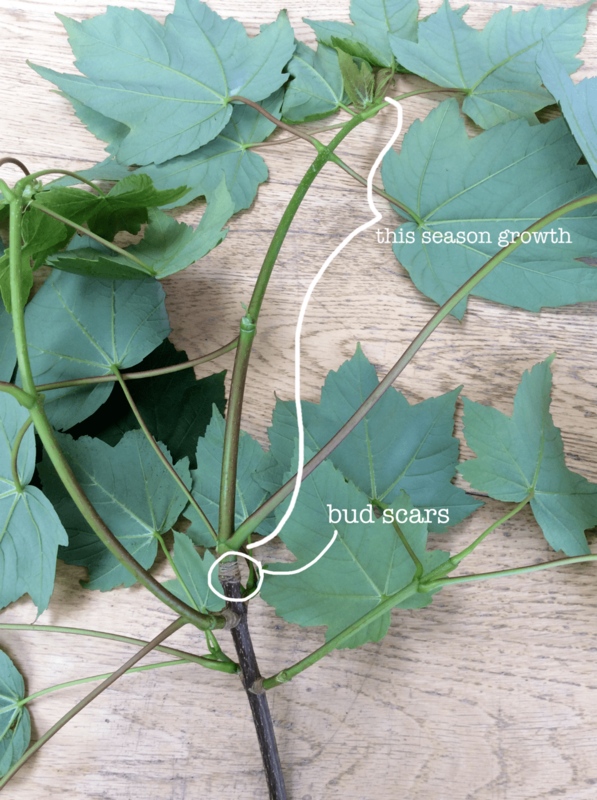 Bud scars are the marks left by the scales that cover the bud when they fall off as the bud grows. these marks for a ring around the branch and show where the seasons growth started. If you follow back along the branch and look carefully you will see the bud scars that mark the beginning of each season. Some bud scales fall , others develop into the leaves of the tree. The photo above is of a Sycamore branch and during the spring as the growth starts the little scales from the buds can be seen on the ground under the tree. Leaf scars are best spotted after the leaves have fallen in autumn, they are the marks left by the leaf stems when they detach from the tree. Some show little faces from the shape of the scars. Characters to the tree stories! In evergreen trees each whorl of branches shows one years growth. try to remember when you get your christmas tree this year and see if you can spot each whorl of branches for each year. Galls of the Oak tree are fascinating shape shifters and also really worth a look. They can tell many stories of the lives of wasps as well as the tree.